Q. What types of rugs do you repair? A. There are over 64,000 rug variations, and we’ll do our best to take good care of your rug, no matter how rare or intricate. We are equipped to handle the repair of your Oriental rugs, including Chinese, Pakistani, Indian and Egyptian rugs. Our team of rug repair experts and technicians are also authorities in dhurry, Berber and olefin rug repair. With few exceptions, most types of area rugs can be repaired by KIWI Services. Q. Do you repair sisal or jute rugs? No. 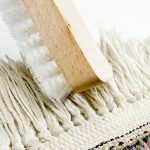 This is because these rugs are made of natural plant fibers that will easily break down when exposed to professional cleaning solutions or equipment. A. From small holes to full restorations, KIWI Services’ rug repair experts have got you covered. We offer fringe replacement, hole-repair, discoloration correction, rip repair, water damage repair, moth proofing and much more. We will even add non-slip padding to your rugs, if desired. Your free quote includes an evaluation of damage and overuse, so don’t worry if you’re not sure what’s wrong with your rug. Q. How much is a rug repair quote? A. Rug repair quotes come at no cost to you. Your free quote is an essential part of our business model and ensures that you get the best possible service for your needs and budget. Contact KIWI Services today for an obligation-free rug repair quote. Feel free to reach out to us by phone at 800-333-KIWI or via our simple and free online quote system. You can even use our handy instant web chat to get an immediate online quote. Q. Where do I bring my rug to be repaired? A. Customers of all ages prefer KIWI because we will gladly pick up, restore and then return your rug to your home at no extra cost to you. You won’t need to worry about transportation at all — leave that to us. Q. Can you reweave my rug? A. Absolutely. We offer rug rebinding and reweaving services as part of our comprehensive rug repair offerings. Q. Can you rebind my rug? A. Yes. We employ a skilled Fringe Surging and Rebinding Specialist who focuses solely on professional rug rebinding. Q. Can you fix a water-damaged rug? A. Yes. Whether from everyday exposure to water or from a flood, KIWI Services will fix water-damaged rugs thoroughly and safely. This includes correcting stains, warping, shrinkage, fading, bleeding and other color-related concerns. We also offer drying and restorations, disinfecting and protecting as well as water-related fringe repair and replacement. Q. Do rug repairs come with cleaning services? A. If necessary, yes. Our Green Carpet Cleaning solutions are safe for most types of rugs, and eradicating deep-seated dirt and stains is an essential part of the restoration process. We want to return your rugs to you looking as good as new, no matter how much time and effort is required. Q. Do you offer rug appraisals? A. Yes. Our team of rug experts knows the ins and outs of rugs, so we’ll gladly provide appraisal services to help you determine the value of your treasured rugs. Q. How long will my rug repair take? A. Your rug repair timeframe will depend on a variety of factors, including the nature of the repairs, how soiled the fibers are and your own schedule and timing preferences. We’ll make every effort to work with you to make sure your rug is repaired in a timely manner. Q. Can you provide a full rug restoration? A. Absolutely. We even employ a specialist just for the job — our Master Weaver. He or she will take care of every element of your restoration, from quote to finished product, to ensure that your rug is returned to you in tip-top sh ape. Q. Do you offer carpet repair services? A. Yes. We are experts when it comes to carpet repair, too. We can fix pet bites, burn holes, rust stains and other permanent stains, ruffled or wavy carpet, loose carpet, flood damage, carpet snags, bleach stains, carpet ripples, carpet bulges, melted carpet, carpets detached from tack strips, exposed seams and much more. Q. How do I know my rug will be safe with KIWI? A. The fact of the matter is, we understand better than anyone that your rugs are expensive and that they may even be family heirlooms. Because of that, we’re dedicated to hiring the most skilled rug experts around, including a Senior Rug Expert, a Master Weaver and a Fringe Surging and Binding Specialist. These professionals know rugs inside out — all 64,000 variations! — and will treat them with love and care. For your peace of mind, we’re fully bonded and insured. A. Yes. 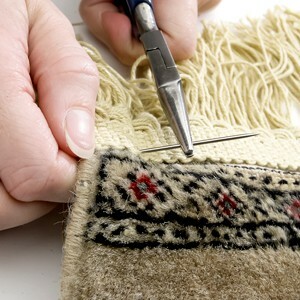 Every single rug repair service from KIWI comes standard with a one-year guarantee. If you’re not satisfied with the workmanship we’ve provided, we’ll gladly fix the problem at no extra cost to you.